If you have been following me for awhile now, you know that when I travel--I have it down to a science. Everything from finding flights, planning my itinerary, budgeting and most importantly packing. 9 out of 10 times, I always opt to travel with just a carry as it is 1) more cost friendly 2) is more efficient. In my Twirling into Summer blog post, I talk about three ways I make traveling with a small carry on possible. My second reason was “packing strategically” and this is something I definitely take very seriously! Whether it comes to my shoes, outfits for the day or even sleepwear. I know it sounds a little crazy, but when you have such a little space, you kind of have to make sure you really have everything down to a science. I love being comfortable when I sleep. I mean who doesn’t right? The sweet spot though is being comfortable, but still looking cute while you’re at it--hey you never know when a photo opportunity may arise! This is why I always opt for a slip dress. It is simple enough to wear to sleep, but still cute so that if I do have a beautiful and well lit hotel room like this one, I’m able to take all the cute photos I want. This Silk Chemise from MYK Silk was definitely the perfect item for my last trip--I had such a blast taking photos with the hotel room’s cute set up. Aka how much space it takes up in my suitcase. This is extremely important to me as space is prime real estate in my suitcases. This is exactly why I do not pack heavy and bulky sweats--they simply take up way too much space. With this Silk Chemise slip, I’m able to pack multiple pairs without taking up much room at all! It packs so nicely. I have really sensitive skin, so I am very picky about the kind of products I wear--especially when it comes to sleepwear (as I do not want to end up getting rashes or hives). 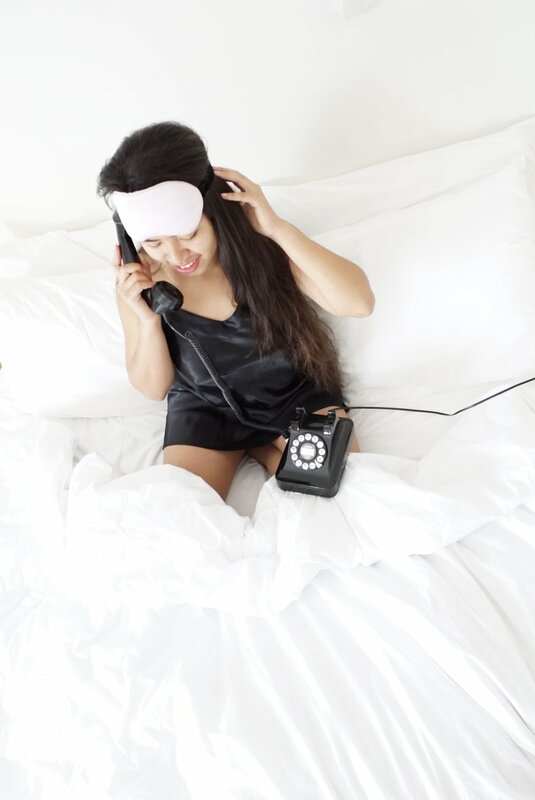 I am very iffy about all sleepwear products at first because I am unsure of how my skin will react to it, but this product definitely is of great quality and made from premium silk so I had no problems whatsoever! Well there you have it! The 3 most important things to me when it comes to deciding on my travel sleepwear. What are some of your criteria?